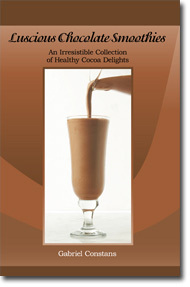 Excerpt from Luscious Chocolate Smoothies: An irresistible collection of healthy cocoa delights. Xocoatil was the Aztecs’ word for “chocolate”. They called it the “bitter drink” and considered it a gift from the Gods. The cocoa bean has been cultivated for the last 1000 years and recorded as early as 2000 BC. Cocoa was first introduced to Europe when Cortés brought the beans to Spain and offered them to the Emperor in the early 1500s. By adding Cinnamon, heat and sugar, they improved the bitter taste. The discovery of cocoa by the Spaniards was so provocative that they kept its existence a secret for almost a century until it was smuggled by monks to France. By the 1650s it had crossed the channel to England and the North American colonies of the English and the Dutch. Cocoa powder and chocolate contain rich sources of polyphenol antioxidants, which are the same beneficial compounds found in fruits, vegetables and red wine that may reduce the risk of developing heart disease. It is believed that damage done in the body by free oxygen radicals is linked to heart disease and other maladies connected with aging. There is some research that indicates that antioxidants in the blood stream help eliminate free radicals, thus reducing the risk of developing heart disease. Dark chocolate contains more antioxidants, per 100 grams, then prunes, raisins, blueberries, blackberries, kale, strawberries, spinach, raspberries, Brussels sprouts, plums, alfalfa sprouts, oranges, red grapes, red bell pepper, cherries, onion, corn or eggplant. Place all the ingredients in a blender and blend on medium speed for 1 minute. Chill for five minutes, pour into tall glasses and serve naked (literally or figuratively). If there is indeed a true aphrodisiac, this is it. Chocolate and strawberries – what a treat! For a truly romantic and adventurous experience, drink one smoothie out of a single glass together with two straws, then take another full glass and use your imagination. Place all the ingredients in a blender, and blend on medium speed for 1 minute. For your next New Year’s Eve or Winter Solstice celebration, make a resolution with this bubbly, non-alcoholic crowd-pleaser. Place all the ingredients, except the mineral water, in a blender, and mix on medium speed for 1 minute. Add the mineral water, and blend on low speed for 5 seconds. Pour into champagne glasses and raise a toast. Garlic is truly the patient’s best friend. It helps cleanse the throat, sinuses, nose, and lungs. It has been used to ward off werewolves, vampires, and “the evil eye,” and has been praised as a cure for every calamity imaginable. Some people believe that if you eat or drink enough garlic, you will live forever: Of course, you may live alone, due to its strong smell. Place all the ingredients in a blender, and mix on medium speed for 30 seconds. Pour into short glasses and drink a wee bit at a time. Cold Comfort has a strong kick. Clasp this drink in your hand and truck on down to your favorite hot spot to “strut your stuff.” With the added oxygen your body receives from the strawberries, you’ll have all the extra energy you need. Place all the ingredients in a blender, and blend on medium speed for 30 seconds. Pour into tall, short, large or small cups and feel the rhythm. The waltz is a gliding, turning dance that overcame hostile opposition to dominate social dancing from 1750 to 1900. It involves six even steps and full turns as slowly or swiftly as the music will take you. Famous early proponents were Johann Strause and Josef Lanner. Cantaloupes are said to alleviate some allergies, reduce bladder infections, relieve bursitis, and prevent memory loss. Pour into champagne glasses and glide. The recipe for The Unthinkable was classified as TOP SECRET by the U.S. government for the last fifty years, but it has now been revealed for your personal pleasure and right to know, by a former member of the NSA. Make sure the lights are off and the blinds are drawn when you concoct this classified formerly secret smoothie. Pour into tall glasses and serve quietly. You never know who may be listening.